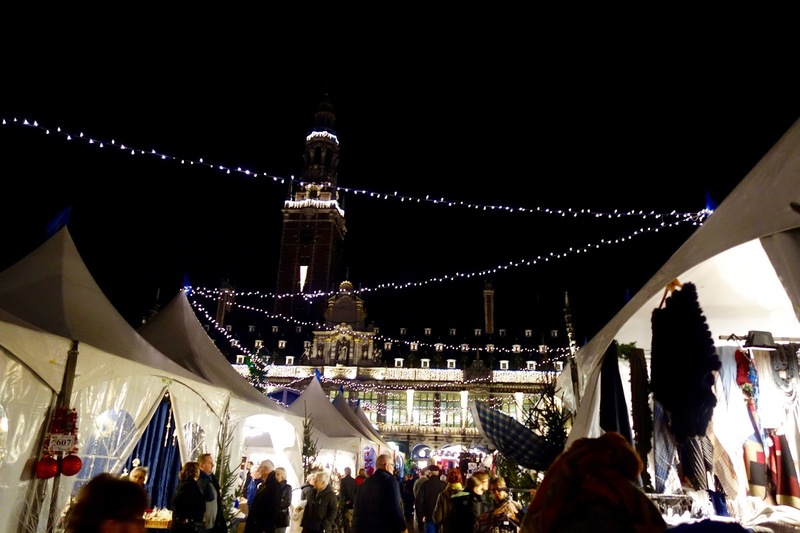 It's my last week in Leuven this year, and besides the obligation of having to study almost every day, my friends and I managed to fit in a couple of Christmas celebrations throughout the week. I also flew back to Edinburgh on Friday - it's a bit strange being home, but I'm enjoying catching up with my family and the comfort of my own bed, so I'm more than happy for the time being. On Monday, I had my last constitutional law lecture in the morning. I knew I had a lot of errands to run, so I did those afterwards, starting with a trip to ACCO to buy some stationary supplies. I dropped into ALMA for lunch and had a 'kerstbroodje' (Christmas bread - cranberry and turkey). I had been working on my Advanced Legal Methods research proposal for an hour a two a day for about a week and had yet to sit down and have a good go at it. So, I decided to spend Monday afternoon in the law library and it turns out I only had a proof read and my bibliography to complete and it was ready to be submitted! I'm so relieved it's out of the way, also a bit concerned as it's the first time I've had to submit ANY work this academic year - I still can't get over the fact we're barely excepted to do any homework in Leuven. I, then, went home and gave into the hype and watched Love Actually for the first time. In my opinion, it's absolutely terrible and I actually ended up turning it off halfway through - what's the big fuss over it?! 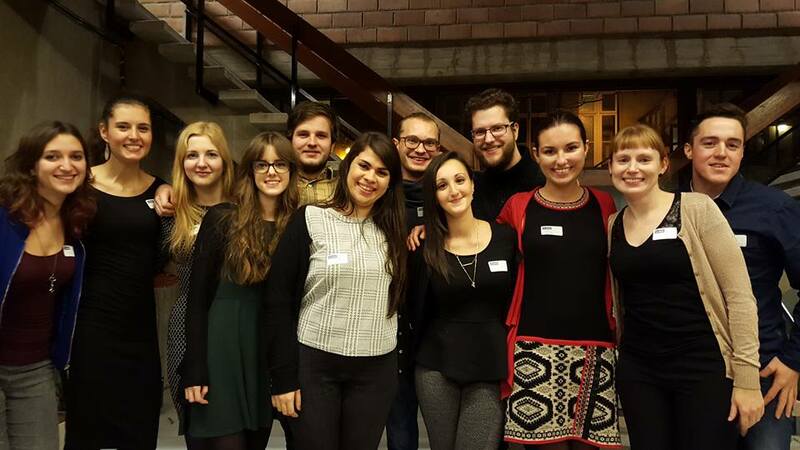 On Tuesday, I had a Criminal law class 4-6pm, followed by an Erasmus dinner which the law faculty kindly organised for us. It was held in the cafeteria of De Valk and although I sat with friends I've known for most of the semester, we were joined by a couple of new faces and it was great to meet more law students. Unfortunately, it's probably one of the last events we'll go to together as a group, as most students here are only staying for one semester. I'll miss them all dearly throughout the Christmas holidays, but hopefully we'll get together one last time at the end of January to celebrate post-exams before they head home for good in February. For dinner, we had Stoofvlees (beef pot roast) and fries for main, followed by Smoutebollen (deep fried doughnuts) for dessert, all washed down with some Glühwine (mulled wine). At the very top of Mgr. 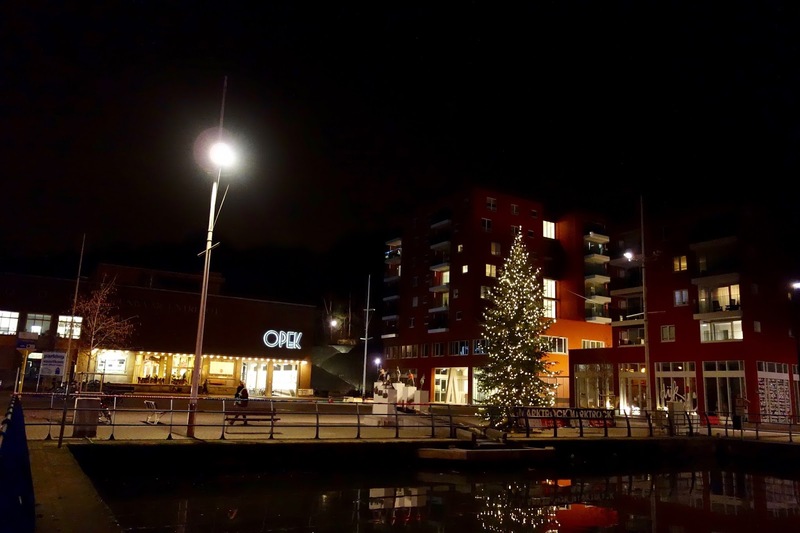 Ladeuzeplein is a temporary two storey restaurant/bar during the Christmas period. 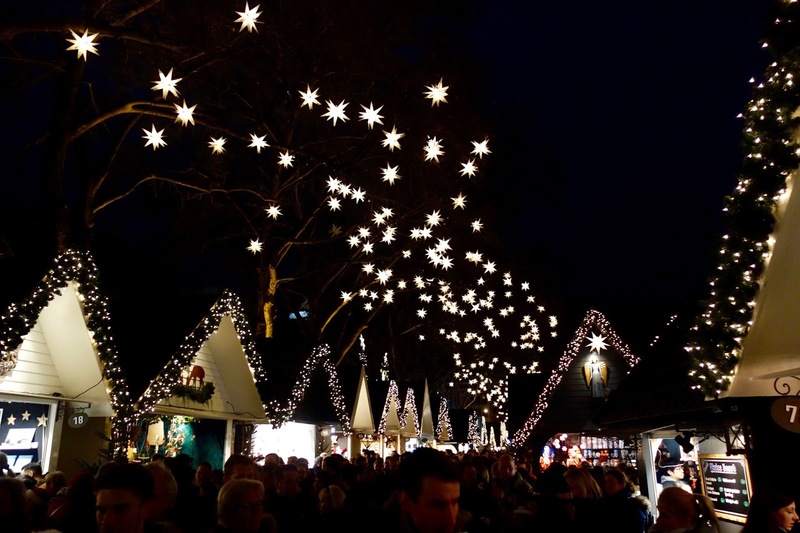 When I first visited the Christmas market last week, I was intrigued by it, so Domen, Dominik and I decided to go there for a drink after our dinner. I'm not usually a beer drinker, but was tempted by a Leffe Kerstbier (Christmas beer) and it was surprisingly quite enjoyable! Afterwards, we headed to the Capital on Grote Markt, which apparently is home to the largest beer collection in the world with over 2000 Belgian beers on the menu. I didn't feel like experimenting that evening, but I've definitely made a mental note to try out a small fraction of the beers on offer next semester. On Wednesday, I had my last Criminal Law class from 9-11am, then I headed home to study and have some lunch. I had an appointment to get my eyelashes done that afternoon, so decided not to go to my Terrorism class, thinking the appointment would take a good hour of two (clearly had my priorities right that day!). However, the appointment only lasted 30 minutes and I've since wrote a blog post about my experience (you can read all about it HERE). 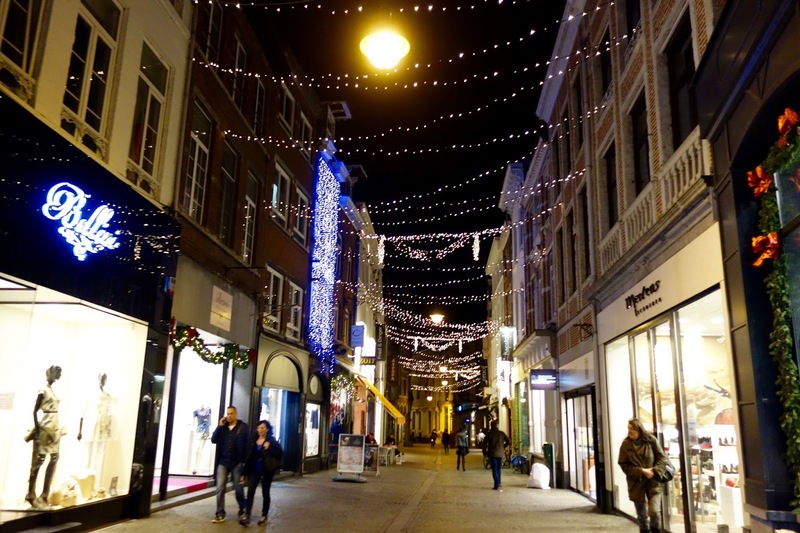 On Thursday, I only had my Human Rights lecture scheduled at 4-6pm, so I decided to venture out and take photos of the Christmas decorations around Leuven that afternoon. 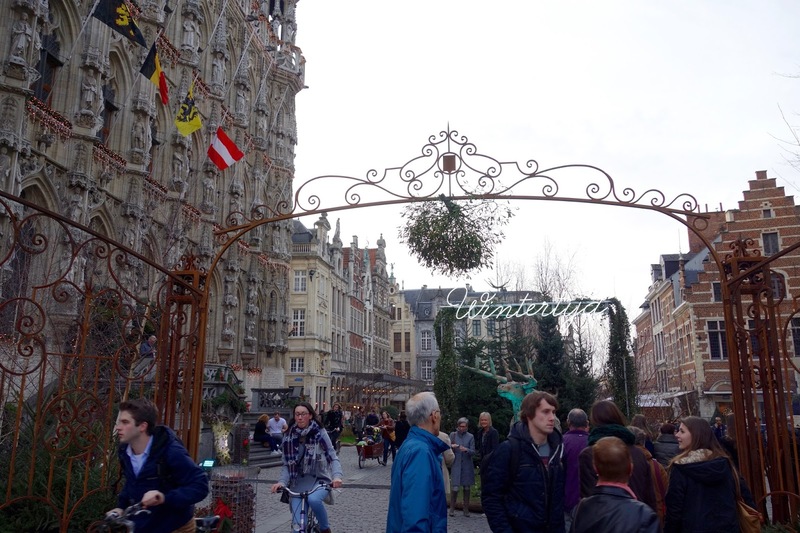 There's a beautiful garden on Grote Markt this month - they've since named the area 'Wintertijd'. I haven't actually explored a lot of Leuven since December started. The whole month seemed to have whizzed by and since I was in Budapest for the first weekend and Cologne the following Saturday, I regrettably haven't had time to see a lot of what Leuven had to offer during the Christmas season. After my lecture, I walked around the Christmas market on Mgr. Ladeuzplein for a quick look and to take some photos of the area. To be honest, the Leuven Christmas market is nothing compared to the markets in Cologne and I even think the Christmas market in Edinburgh is a lot better. 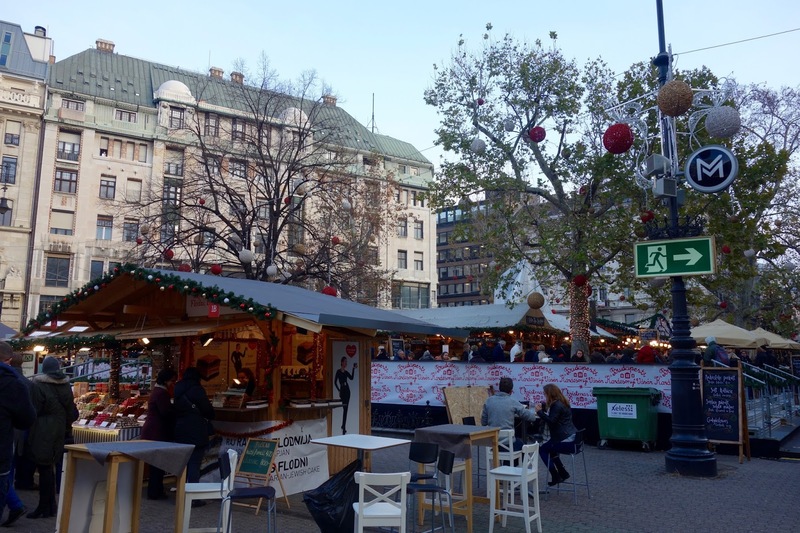 I was quite disappointed by the white tents that covered the square, I think it would look a lot more traditional and festive with wooden huts, but as the Christmas market is only present for 10 days, I guess that would involve a LOT of preparation. 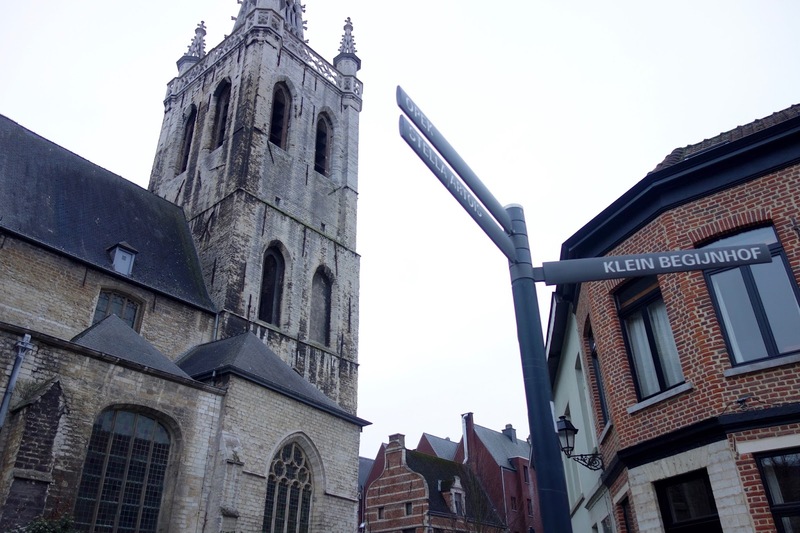 Compared to big cities such as Edinburgh and Cologne, I didn't really expect Leuven to compare in that respect. When I got back to my residence, I packed my suitcase and did some last minute preparations before leaving for Edinburgh on Friday morning. As I didn't have any plans for Friday apart from flying home, I left my residence earlier than originally planned at 10.30am and headed to Leuven station. 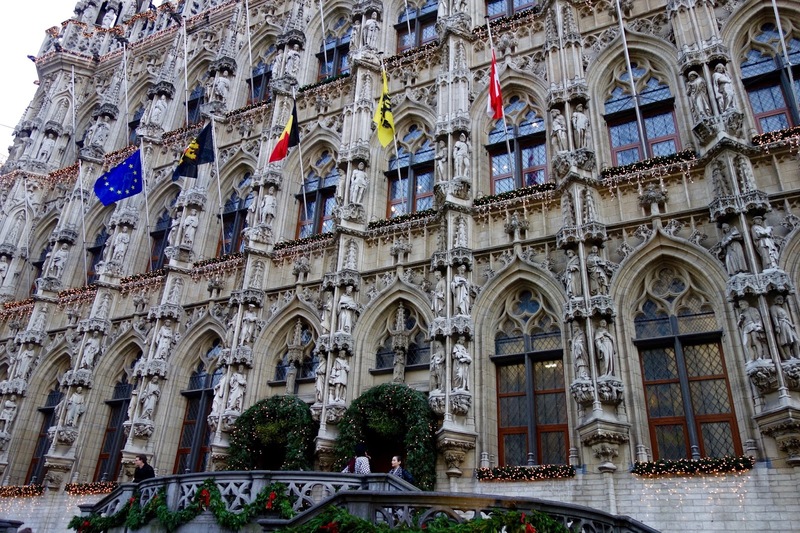 Flying from Brussels International airport requires a quick 15 minute train journey from Leuven. I got to the airport at 11:30am and had a good few hours to shop around and have lunch before my flight at 2:30pm. I arrived in Edinburgh at 3:10pm (local time) and my Dad was there to pick me up from the airport soon after. Since arriving home, my family and I have had takeaway dinners, movie nights and have gone out for lunch together. It's so good to be back! I'm back in Edinburgh for just over three weeks and although I have a lot of catching up to do with family and friends, I'll be spending the majority of my free time either in the University library or in my room studying. My first exam is on the 16th of January and I know they'll creep up on me quickly after the Christmas and New year celebrations are over. As I'm not officially 'Living in Leuven' during this period, I think I'll take a break from weekly blogging until my exams in Leuven are over and my life is a little more interesting again. I have a LOT of University work to catch up on and even when I arrive in Leuven again on the 10th of January, I'll be stuck in my room until the 27th when my exams are complete! If you have exams at the start of next year - good luck! 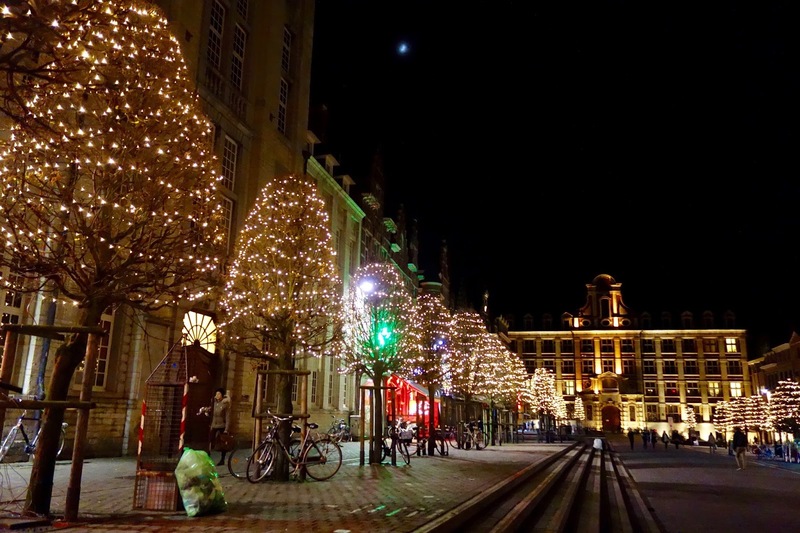 In the meantime, have a great Christmas & New Year and I'll see you when 'Living in Leuven' posts resume in 2016! I hate my eyelashes. They aren't very dark and although they are quite long, the length weighs them down and they're pin straight. Not a day goes by where I can leave the house without using eyelash curlers blasted with the hot heat of the hairdryer and lashings of black mascara. 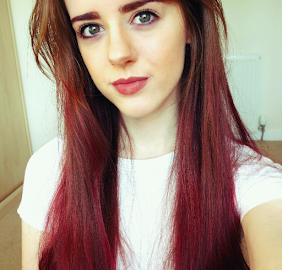 I don't mind doing it (I LOVE makeup), I'm happy to sit for an extra 10 minutes to do my eye makeup, but I fancied a change. So, I booked in to get some eyelash extensions near where I live in Belgium. I'm not going to name and shame the salon, as I do think it was party my fault, but I want to share my experience and also some tips if you're ever interested in investing in a set. Initially, I was super impressed with the results but after being told they would last for 6 weeks, they soon started to all out after a mere 48 hours. After showering (and taking care to avoid getting my eyes wet), the lashes started to slowly fall out of place and not look as natural as I had originally hoped. Eyelash extensions should be applied on your eyelashes, not your skin. My eyelashes were applied to the skin on my lash line. When the beautician had finished, I instantly noticed the glue used had turned black when dried, so I was left with false eyelashes with what looked like quite heavy liquid eyeliner application too. Definitely an advantage getting to skip eye liner every day, but not very practical as common bodily functions such as sweating, crying etc. had to be avoided as this wore away the glue and my lashes fell off within a matter of days. Expect to pay extra for a decent set of lashes. I paid 35 EUR (approx £25) for my set, but in reality I should have expected to spend between £50-£200. The lashes that were applied looked very cheap, were in clusters of 4 lashes and took only 20 minutes to apply. Think realistically, the more expensive the procedure, the longer the beautician should spend applying good-quality, individual lashes. The procedure should take anywhere between 1-2 hours. A good beauty salon should aim to apply between 60-100 individual lashes to each eye. Of course, the longer your appointment, the more lashes you should expect to have applied and the better the finished result. 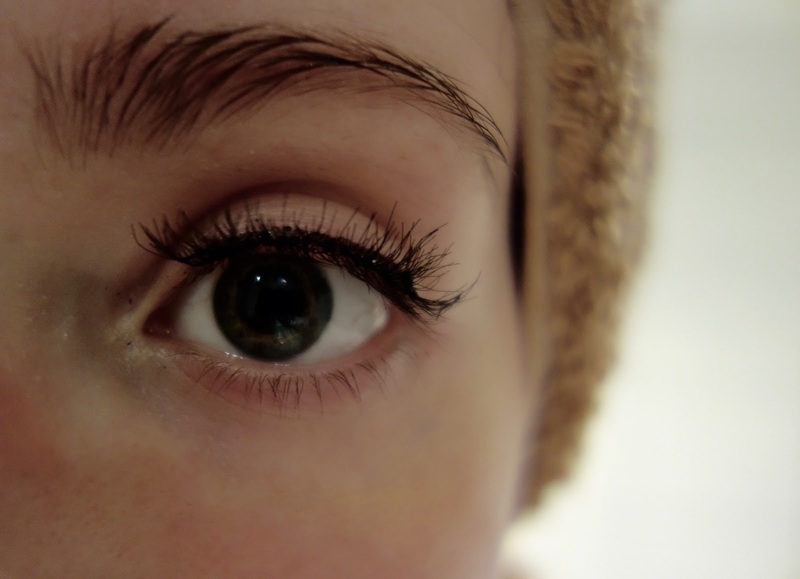 Good eyelash extensions shouldn't damage your natural eyelashes. Eyelash extensions fall out naturally, alongside your natural lashes. There should be no damage done to your natural lashes unless you've pulled the eyelash extensions out or if they've been applied incorrectly by the beautician. Ask questions. Finally, contact your beauty salon and ask questions about the procedure. I did the typical British thing of nodding and accepting what the beautician was doing whilst I was fully aware what I was experiencing was not what I expected after doing my research. Showering and washing your face is challenging. 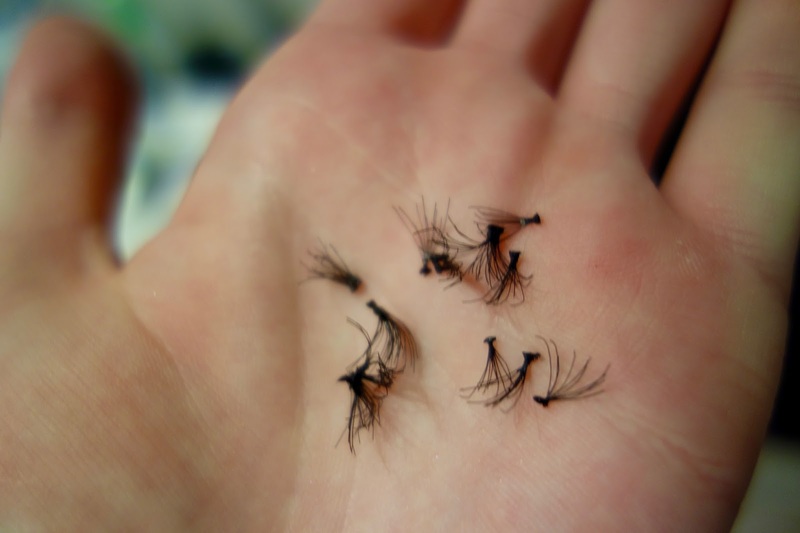 It's not advised to get your eyelash extensions wet, especially during the first 24 hours after application. As I wished to prolong the life of my extensions for as long as possible, I opted to take baths instead of showers and frequently washed my hair over the bath to avoid getting my face wet. I also, regrettably, cleansed my face with just a wipe instead of my usual face wash routine to avoid getting water in and around my eyes. You'll have to change your sleeping position. I love sleeping on my stomach and side and I definitely had a couple of restless nights getting used to lying on my back when my lashes were first applied. Don't lie with your face in the pillow as the friction can pull your eyelash extensions out and cause tangles in your lashes. Eyelash extensions require a lot of upkeep. Your natural lash cycle is between 6-8 weeks, so you should expect your extensions to last this period of time. Your eyelashes will not all fall out at once, so the overall look can start to appear a bit sparse between 3-4 weeks, meaning another appointment at the salon for a refill. Of course, this can be time consuming and expensive in the long run, so consider this before committing to a set of eyelash extensions. I hope this post was helpful, albeit somewhat rambly, I really felt the need to share my experience with you so you can avoid what I did and feel fully satisfied with your eyelash appointment. In my opinion, eyelash extensions are definitely worth it. They look phenomenal and I always feel so confident with a set on. Just make sure you research the salon prior to booking an appointment to make sure you aren't ripped off and your expectations of beautiful, full lashes are met! I can't believe I'll be back in Edinburgh this time next week for Christmas - this semester has flown by! I'm actually really upset to be leaving Leuven next week, so I've been trying to make the most of my final few weeks with friends that are only staying in Leuven for one semester. After a weekend of non-stop sightseeing in Budapest, I felt absolutely exhausted during my 9am Constitutional Law class on Monday morning. In the afternoon, I spontaneously decided to re-arrange my room (which you'll see a blog post on at the beginning of next year) and crashed in bed by 8pm! The final hand-in for the Advanced Legal Method online course in Edinburgh is due on the 18th of December, so I met my friend from Edinburgh on Tuesday afternoon to go through the assignment. We have a nice coffee and catch up in Cafe Anna (my new favourite tea room in Leuven). In amongst classes this week, I've been stuck in the library working on my research proposal. I don't think the online course I'm taking back home is that well thought out for year abroad students, so I'm definitely struggling to get my head around it all. That combined with absolutely no motivation due to the different teaching structure here is Leuven is making the task almost impossible to complete! After a day of classes and hard work on Wednesday, I met one of my Belgian friends for a quick catch up at Coffee College on Thursday before heading to my Human Rights class. As a lot of my friends have been swamped with last-minute essays and Dutch exams before Christmas, every one has been pretty busy so catching up with friends this week has been a rarity. I managed to convince Una into going to ALMA for dinner after the lecture , then we briefly visited the Christmas market in Leuven before heading home. 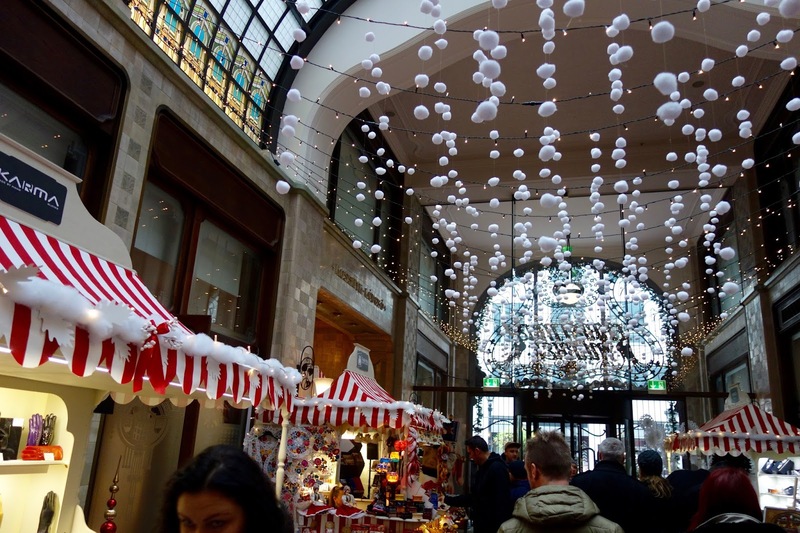 I'm really looking forward to visiting the Christmas market properly next week - I'll be sure to go into detail about it more in next week's post! Friday consisted of a trip to the library during the day followed by my usual 4-6pm Human rights lecture. It was one of my Scottish friend's birthday gathering at my residence that evening, so Una and I went round to his kitchen for a quick catch up. 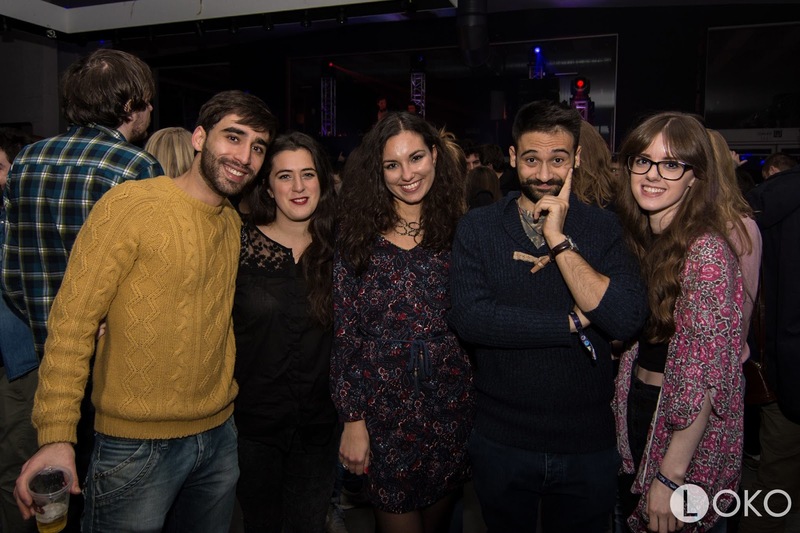 Originally, we had planned to meet at Una's kitchen with her flatmates before heading to the final ESN party of the year. However, as we went into the lobby of our residence, we met a group of our law friends who were heading to the opening of the residence's common room. Literally everyone in Leuven had heard about this party apart from us! Our new common room is actually pretty cool - the room has a cosy corner with sofas (TV coming soon!) then the other side is filled with table tennis tables, pool tables and a fridge. I definitely think the room will be put to good use next year - pre-parties in our kitchens are OK, but not very practical as the security is quite tight meaning it's almost impossible for the public to enter without at least a key card and a set of keys. 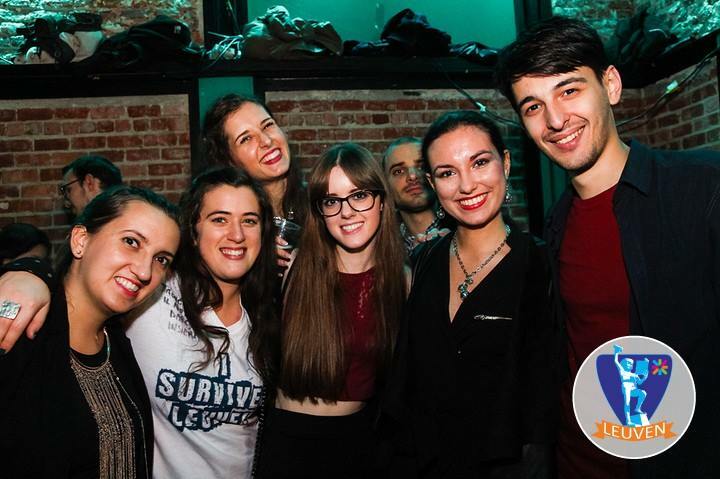 We headed to Fuifzaal Albatros for the ESN: I survived Leuven party. The party was great and it was really nice to see everyone out to celebrate the end of the semester together. 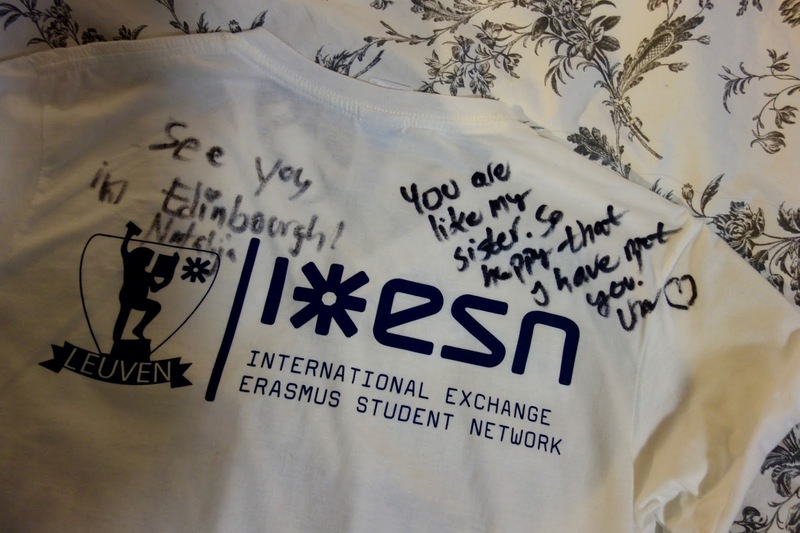 ESN were selling t-shirts and pens at the event, so for most of the night we went round trading our t-shirts in return for messages written on them. As I was going to Cologne early the next again morning, I called it a night at 2am. I was one of the sensible ones who decided to leave earlier than usual from the party and although I only had 2 hours sleep, some of my friends didn't make the 8am bus because they had slept in or were still out partying! The disappointment of being let down by my friends soon disappeared when I met friends from previous ESN trips (Anna, Anett and Nina) on the bus. The drive to Cologne took 2.5 hours and it's fair to say I have no recollection of what it's like to drive on a German Autobahn as I slept for the whole journey there and back! We arrived in Cologne at 11am where we were shown our meeting point later on in the evening by the city's Cathedral. The Cathedral (or Dom, in German) is lovely and although it was packed with tourists, it's worth a look around inside - it's free! Afterwards, we climbed the 533 steps to the top of the cathedral. There was only one spiral staircase to the top for both people walking up and down to use - definitely made it quite dangerous having to keep moving into the narrower stairs in the middle to move past other people! We took some photos of the view at the top of the tower then headed back down. It didn't quite hit me how many steps we climbed until walking around the Christmas market later at midday - both of my legs wouldn't stop shaking and I thought I was going a bit crazy until the other girls said it was happening to them too. Bizarre! We wandered around the Christmas market by the Cathedral, where we decided to warm up with some hot chocolate. For lunch, the girls had Raclette cheese on bread, which I may have had also, but I was so put off by the smell of the cheese I opted for a traditional Bratwurst hot dog instead. 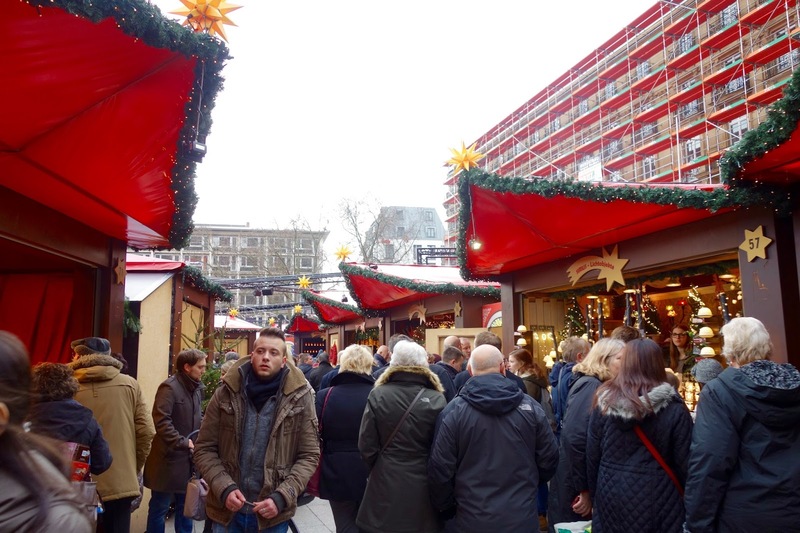 All of the Christmas markets in Cologne were absolutely packed and walking through the market itself took a lot of time as the queue around moved very, very slowly. 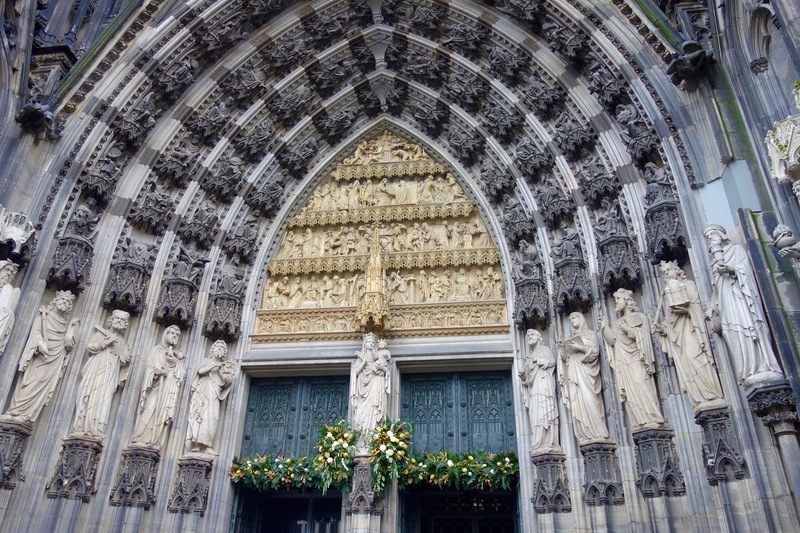 If we had arrived earlier on in the morning, we probably would have spent more time properly looking at the stalls, but as we had to see the whole of what Cologne had to offer in only one day, we decided to keep moving through the attractions. 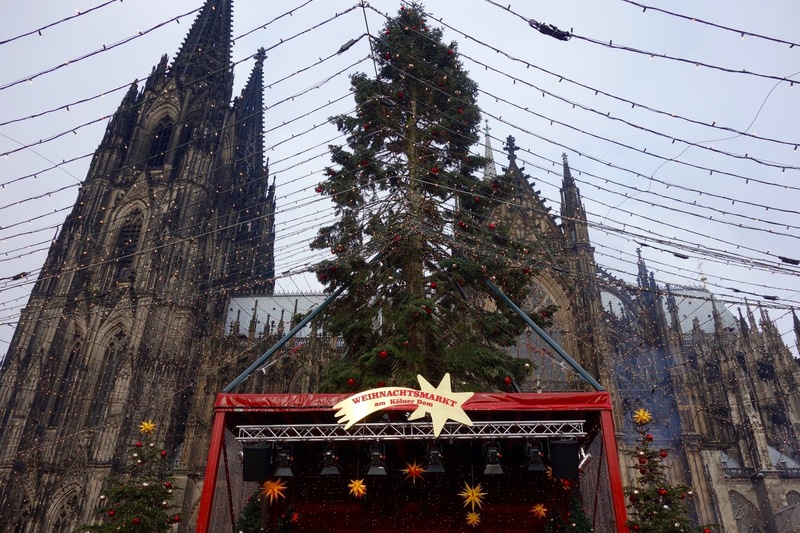 As we were only offered a tourist guide in either French or Dutch, we thought it would be best to invest in the Christmas shuttle train to take us round the main sights in Cologne. 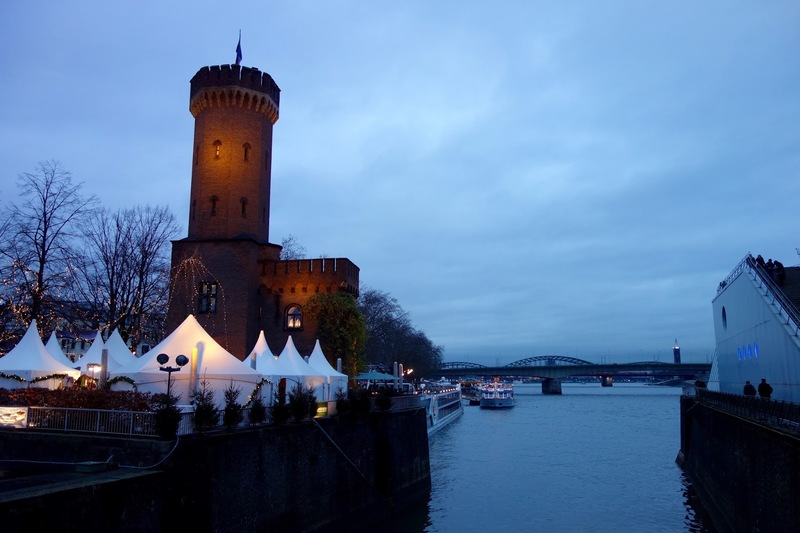 The ticket cost 8EUR and took us to the three main Christmas markets in Cologne as well as the Chocolate Museum. Thinking back, we probably could have walked everywhere in half the time the train was moving, but at least we didn't have to face the difficulty of solving a foreign map in a foreign city! 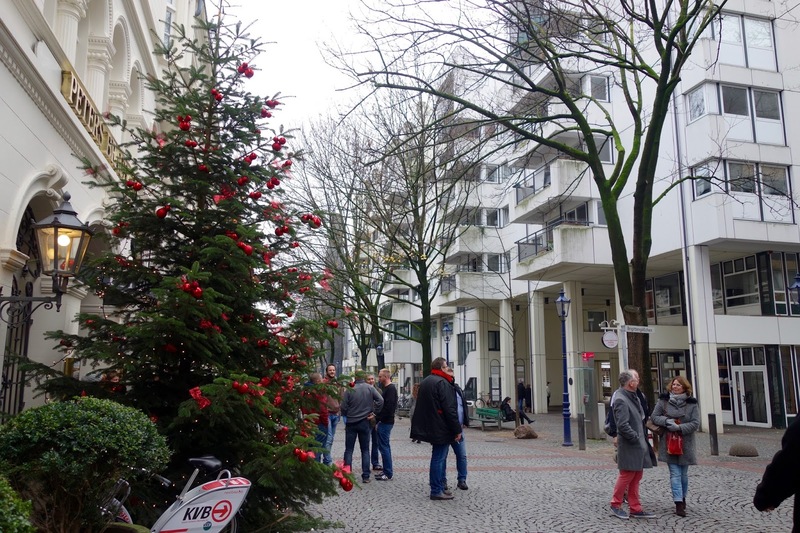 The train took us from the Cathedral to Cologne's Old Market (Altstadt). 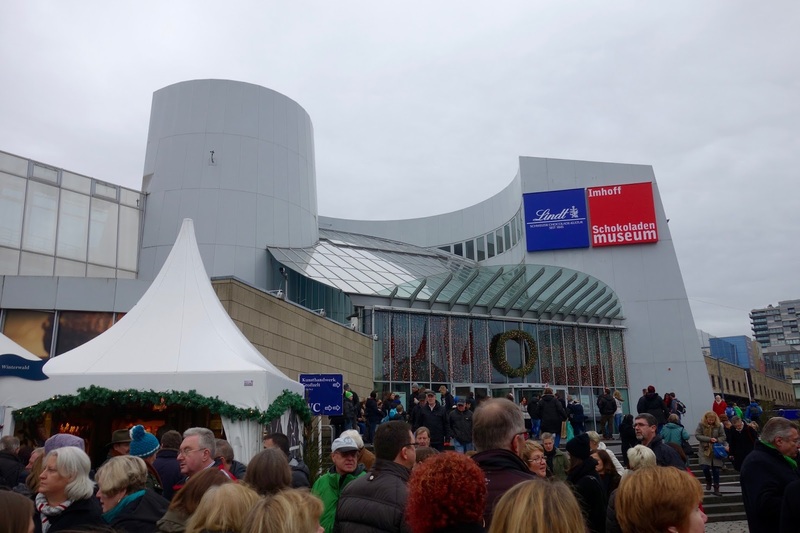 The Christmas market here was very traditional and watching the Germans mould horseshoes and carve wood into Christmas shapes really added a special touch to visiting the market. 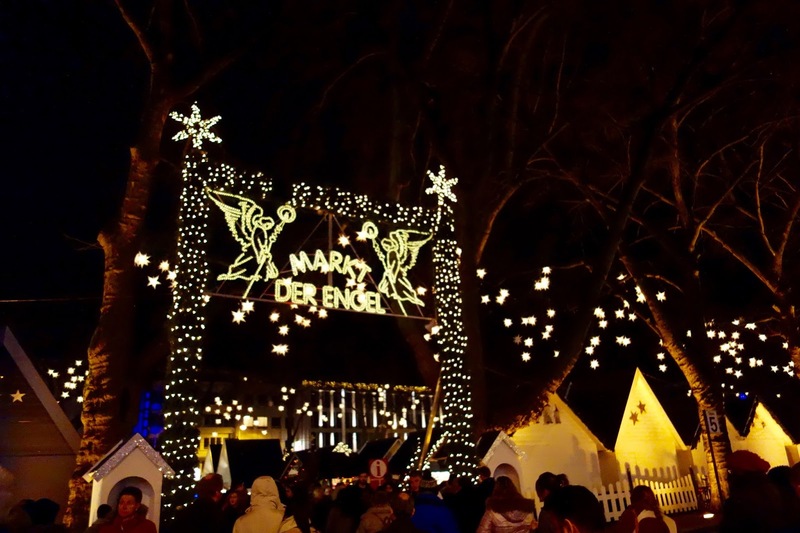 We have a replica of a German market in Edinburgh and the Christmas market in Leuven is somewhat inspired by the Germans, however, there's definitely no comparison to visiting a Christmas market in Germany itself! 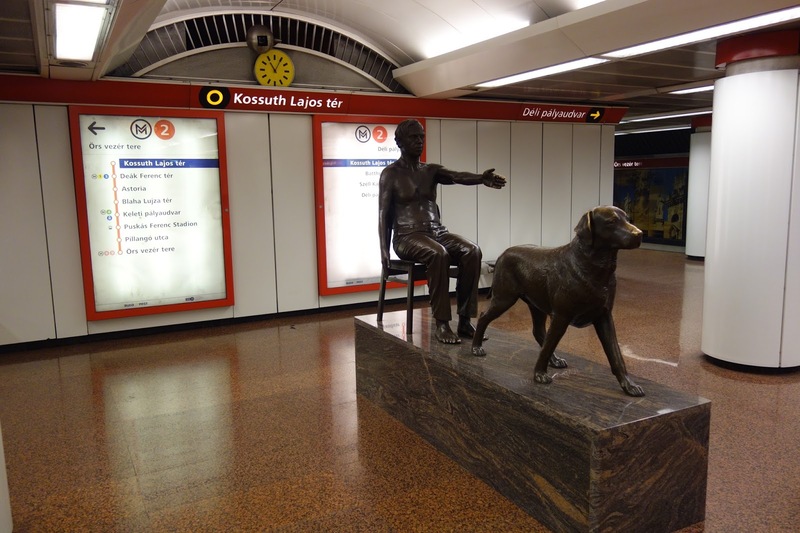 We then took the shuttle train from the Old Market to the Chocolate museum (Schokoladen Museum). I'm a complete chocoholic, so I was really excited about this stop. I find most museums, in general, to be pretty hit or miss. You either get more than your money's worth for the experience or you leave knowing you completely wasted your money on it. The latter didn't apply here and I thoroughly enjoyed the Chocolate museum. 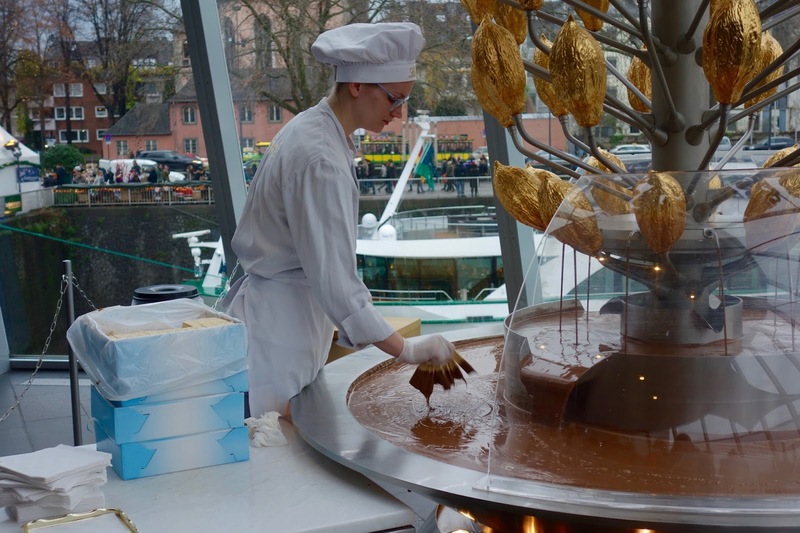 The initial exhibition focused on cocoa beans and how chocolate is transported to the factory, how it's made and how it's eventually packaged. Upstairs, we viewed live demonstrations of Lindt chocolatiers make the Lindor balls and bars of Lindt chocolate from scratch. Another chocolatier served biscuits topped with Lindt chocolate from the chocolate fountain running at the back of the room - I was in HEAVEN! Behind the Lindt factory part of the museum was a room full of Lindt packaging and chocolate advertisements throughout the years. I love looking at old posters and I was really fascinated by the chocolate posters throughout the period of WW2. On my way out, I noticed a video was playing of the apparent 'Chocolate King' alongside a few posters and a painting of him. I didn't read into it, but if there's a Chocolate Queen position, I'd like to put myself forward please! The visit ended with a trip to the Lindt chocolate shop where I bought a fair selection of chocolates for my family back home. We hopped on the shuttle train which took us to our final destination - the Angel Market in the new market (Markt Der Engel/Neumarkt). At this point of the day, it was dark outside and the market looked beautiful under all of the lights around the huts and lights in the trees above. I found myself wanting to buy more from the Angel Market than the other markets. I find most Christmas markets have a lot of jewellery and clothing stalls, which I'm not too bothered by, but this market had a lot more Christmas ornament and souvenirs, which I much preferred. My friends bought some Flammkuchen for dinner. I don't consider myself a fussy eater, but I'm always a bit sceptical of foods in Christmas markets. I'm not a fan of strong smelling/tasting cheeses and fish, so I tend to stick with fries and Bratwurst, both of which I know I will like and will not go to waste. We rode the shuttle train one last time back to the Cathedral where we met the rest of the ESN group and headed back to Leuven. 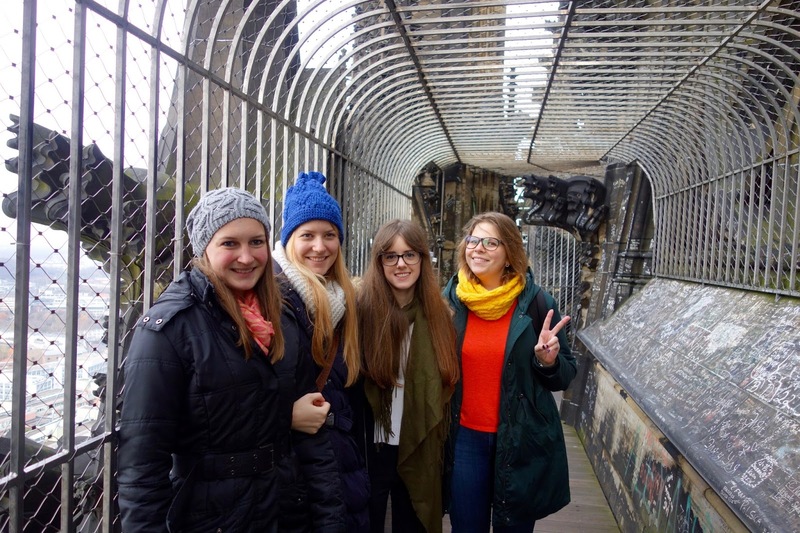 Despite the slight mishap with plans going askew in the morning and my friends not showing up, I had a great day exploring Cologne with Anna, Anett and Nina! 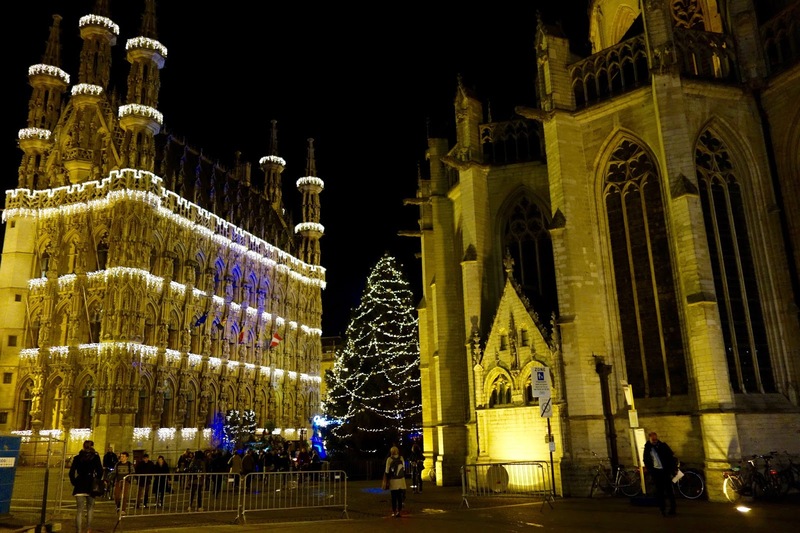 Next week is busy - I have a law erasmus dinner to attend, a visit to the Leuven Christmas market, classes as usual and somehow have to fit in doing my Advanced Legal Methods research proposal and start studying in between that! Oh, and of course, I'm flying back to Edinburgh on Friday. See you next week! Monday began with a Constitutional Law class at 9am and I then decided to travel to Antwerp on a shopping trip (very last minute, might I add). 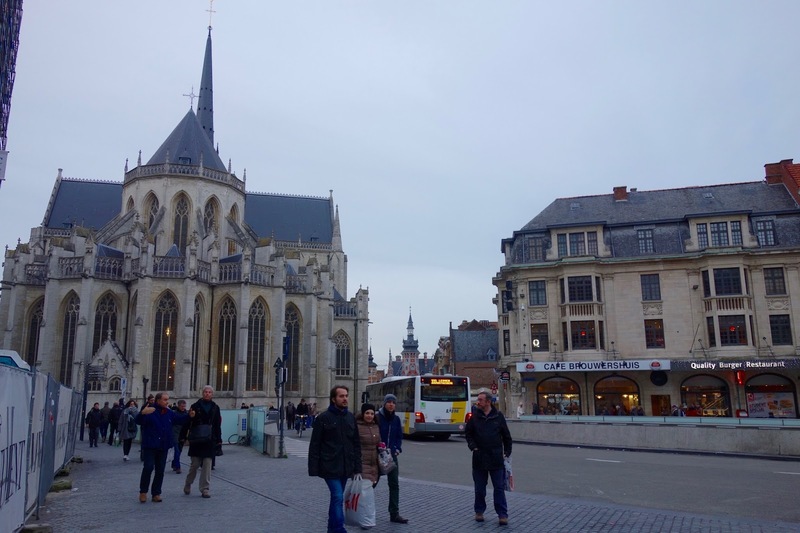 Again, with the nerves I explained a few blog posts back about travelling to Brussels on my own, I travelled an hour away from Leuven and directed myself around Antwerp without feeling anxious or apprehensive at all! I travelled to Antwerp mainly to visit Forever 21. We only have a Forever 21 in Glasgow back home and it was always a nightmare having to dedicate a whole day shopping in Glasgow, so those trips rarely happened. I bought a black winter jacket, a few scarves and some dresses so I had a very, very successful shop! I also managed to pick up a pair of black boots. I despise shoe shopping, so I tend to avoid it at all costs, but somehow a miracle happened and I finally grabbed a pair I really liked and actually fit me - despite the slightly terrifying 60 euro price tag. Despite the Brussels terror threat level decreasing to 3 at the start of the week, soldiers are still lurking around Antwerp. When I was walking back to the train station, I actually saw four armed soldiers standing outside Panos, which is in fact a sandwich shop here in Belgium! 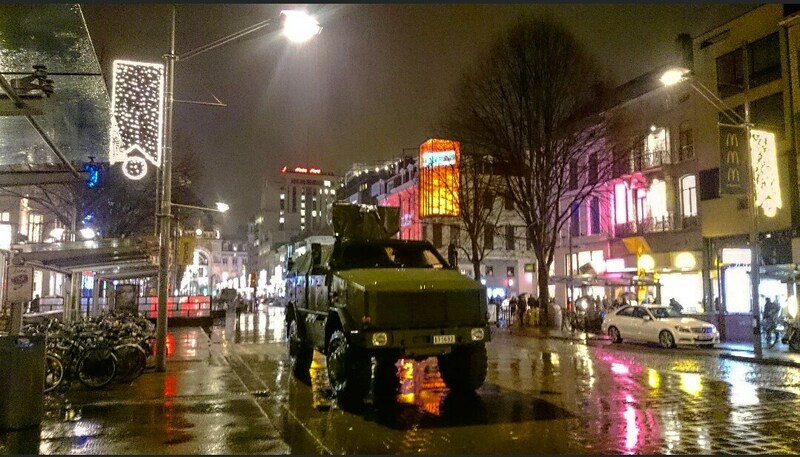 The photo above is of one of the soldier's vehicles parked on Meir - the main shopping street in Antwerp. When I came back from Antwerp, I had to pop by the ESN office to pay for my ticket to Cologne next weekend, and I somehow managed to sprain my knee from walking around all day in terrible footwear. My knee is still bandaged up today, but thankfully I managed to have a few more chilled days than usual throughout the week. On Tuesday, I had a Criminal Law lecture scheduled at 4pm, then quickly went home to get changed. I met my friend at Aula Pieter de Somer (KU Leuven Auditorium) where the Arenberg Orchestra performed their Winterconcerten. All the pieces they played were very recognisable and despite not being able to understand the Dutch commentary, I thoroughly enjoyed the concert. It, again, made me miss playing viola terribly and taking my viola to Leuven is something I'm most definitely considering for next semester. Wednesday is my busiest academic day in Leuven. I usually have a 9-11am Criminal Law class followed by a 11-1pm Constitutional Law class, an hour break, then a 2-4pm Terrorism & Corporate Crime class. By the end of a Wednesday afternoon, I'm usually exhausted, so the evenings are always pretty relaxed for me. However, since I was heading to Budapest on Friday morning, I had to put a quick washing on that evening in preparation. I spent Thursday completing errands such as printing off boarding cards and various e-tickets for weekend plans. I had a Human Rights lecture 4-6pm, but I ended up leaving halfway through the lecture to have an early dinner and pack my suitcase. My flight to Budapest was at 8:50am on Friday morning. My friend and I managed to book cheap tickets flying from Brussels Charleroi airport, which seemed like a good idea at the time, but it meant leaving Leuven at 5:30am in order to get to Charleroi in time for our flight. Travelling to Brussels Charleroi from Leuven requires a 40 minute train journey to Brussels Midi/Zuid, then an hour bus ride to the airport. 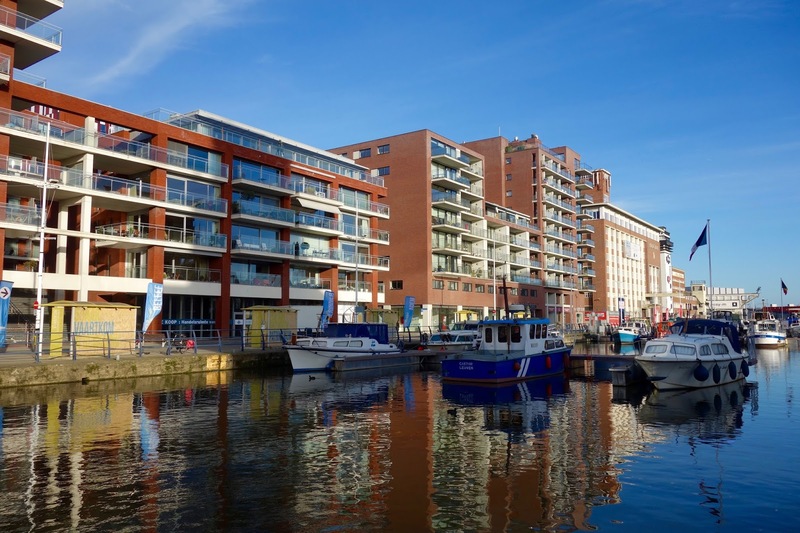 Nowadays, I always look for flights from Brussels International (as it's more convenient) but flights from there are usually very expensive, so Charleroi is often my only option. We arrived in Budapest at 10:45am and waited for our airport transfer bus. Although being the first in the queue for the mini bus, the Wizzair driver wouldn't let us on the bus as our flight had arrived later than everyone else in the queue, so we had to wait over an hour for the next bus! We expected the transfer to be door-to-door service, but the driver dropped us all off in the city centre and we were left to our own devices to direct ourselves around an unfamiliar capital city - definitely will not be booking any airport-hotel transfers in the future again! To our relief, we stumbled across a tourist information stall, who directed us to the Marriott hotel. Not so helpful, might I add, because we were directed to the main Marriott hotel and not the Courtyard Marriott to which we were staying. So, we ended up taking a cheap New-York-like yellow cab to our hotel. After checking in, we decided to take the tram back to where the airport bus dropped us off to have a look around. 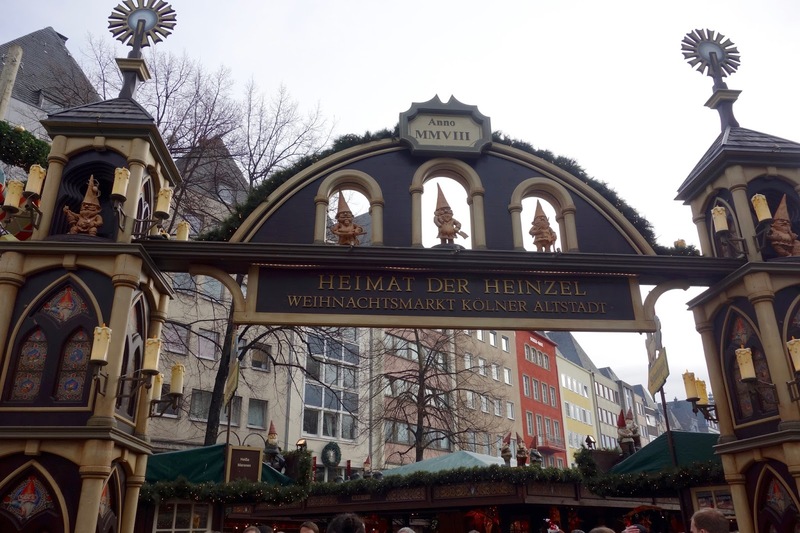 We walked through the Christmas market, where I had the most expensive hot dog I've ever had in my life. Because our hotel was so cheap, I assumed everything in Budapest was equally as cheap, so I didn't even question the price when I was asked to pay 3000Ft for a hot dog (FYI: this equates to around 9 EUROS!). 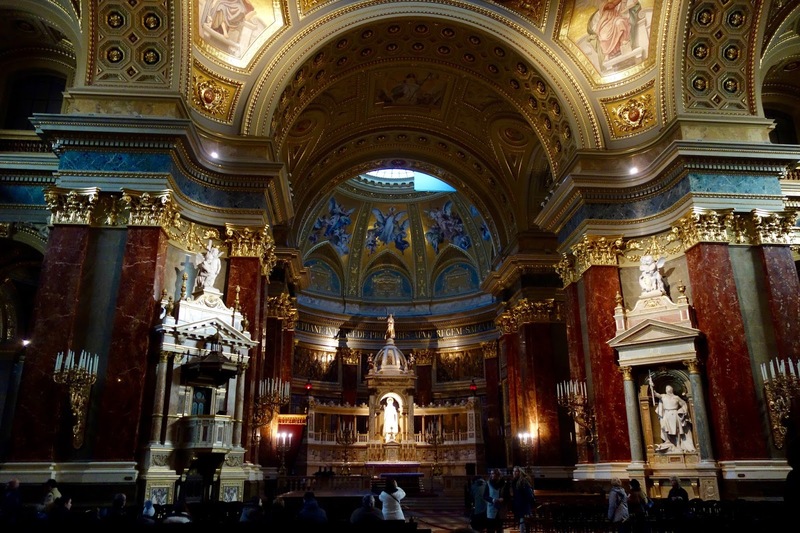 As we were walking around Budapest, we stumbled across St Stephen's Basilica, which was absolutely stunning! There was a small entrance fee, which I couldn't find any change for, so was going to wait outside whilst Dominik explored, but the man at the gate very kindly ushered me in free of charge. The interior was absolutely breathtaking. To me, most religious buildings look quite similar and I'm never usually overwhelmed by the architecture, but St Stephen's Basilica was spectacular! 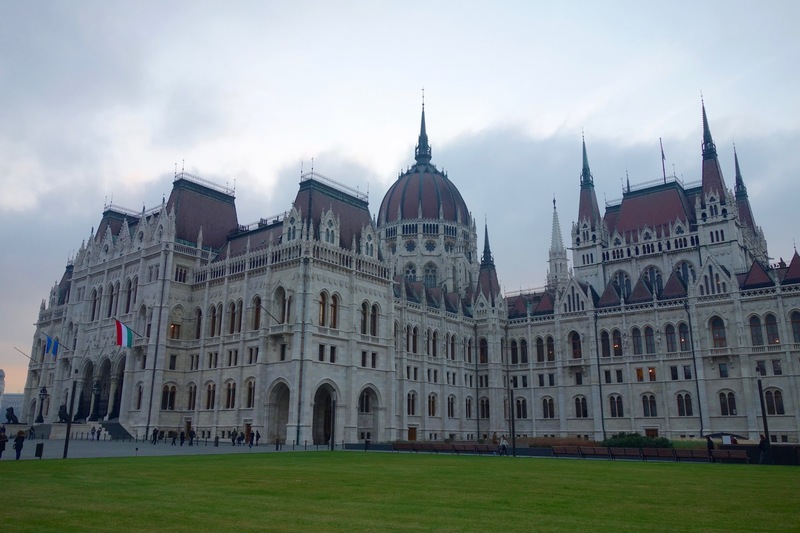 We walked to the Hungarian Parliament (the first photo of this blog post) and spent a good half an hour or so taking photos of it from all angles - the buildings in Budapest are phenomenal! 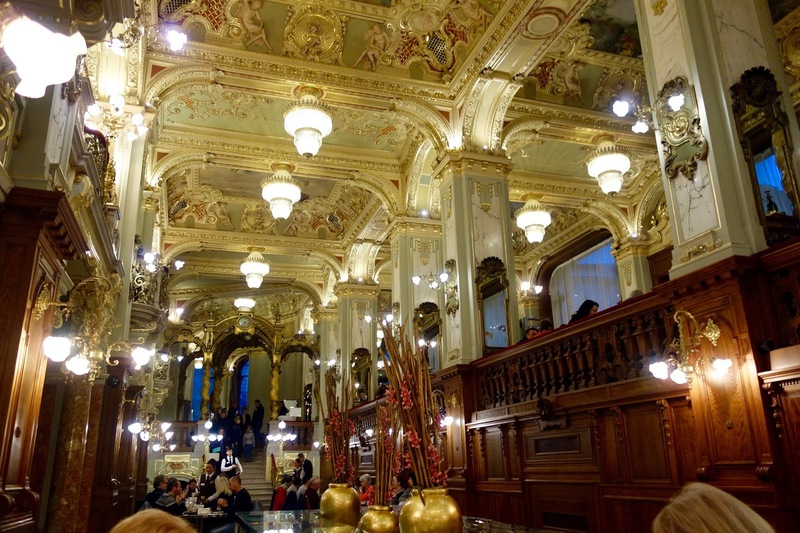 Surprisingly, we actually struggled to find cafes and restaurants in Budapest. On Friday afternoon, we couldn't find a cafe near the Parliament, so settled for a traditional Japanese tea house. The original 'house special' blend was absolutely disgusting, so we wasted a couple thousand Forint on that. Around dinner time, we took the metro to the Opera house and Heroes' square, then decided to look for dinner on the way back to our hotel. All of the Italian restaurants we went into were fully booked, so we decided to go into a traditional Hungarian restaurant. As the restaurant was located on the main road towards Heroes' square, we assumed the restaurant would be full, but we were in fact the only ones there! We immediately felt awkward with only the waitress and chef hovering around and waiting for our order, so we decided to make up an excuse and leave asap. After eventually finding an Italian restaurant for dinner, we decided to turn in for an early night as we had both been up since about 4am that morning. Brief history note(! 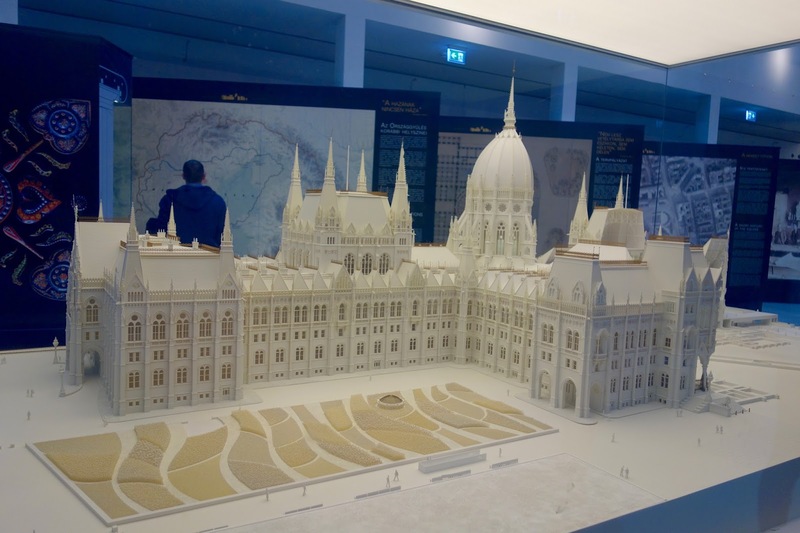 ): Budapest became one city in 1873, but before that, it was divided into Buda and Pest, separated by the Danube river. We were staying and exploring in the Pest part of Budapest, so decided to visit the Buda part across the river on Saturday. The main tourist attractions in Buda include Buda Castle, which can be seen clearly across the river in Pest, and Matthias Church. 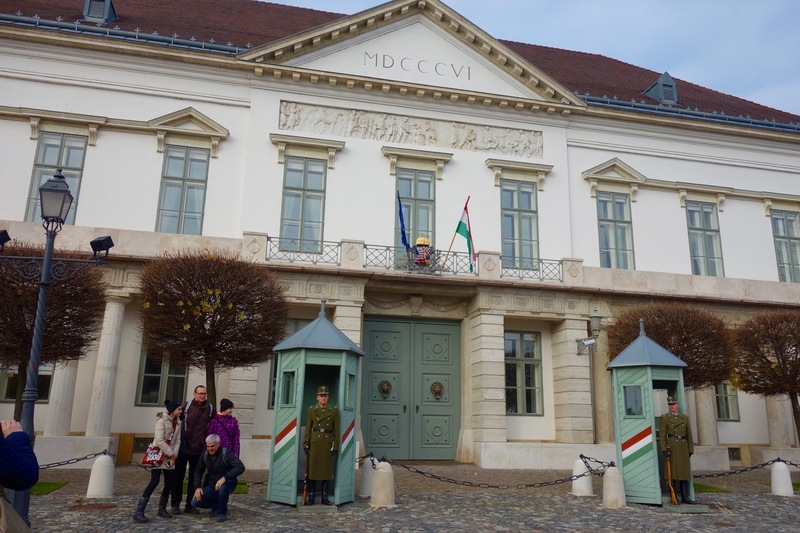 The castle grounds were beautiful and are home to Sándor Palace (official residence of the President of Hungary), the National Museum and the History Museum. Unfortunately, we didn't devote enough time to explore inside the Museums, but managed to walk around the castle grounds and take photos of our surroundings. 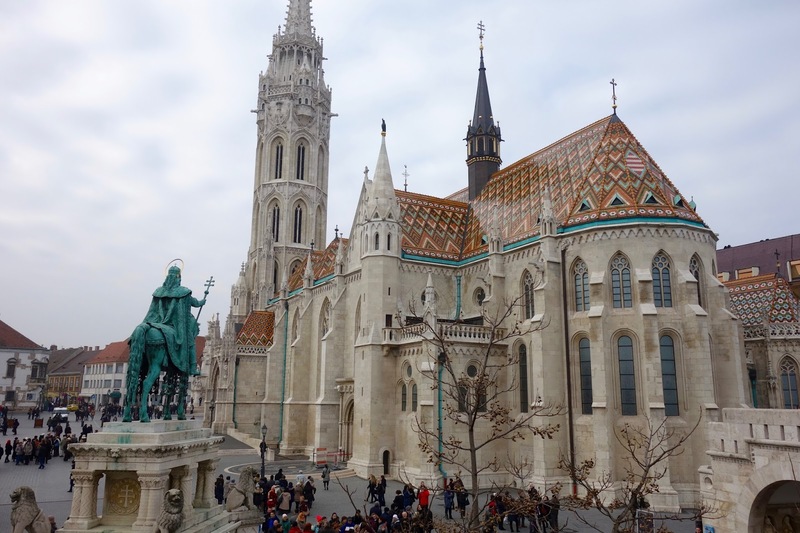 I was also mesmerised by the exterior of Matthias Church near the castle grounds. The colours on the roof of the building were breathtaking, comparable to what I can imagine St Stephen's Church in Vienna to look like. We didn't manage to explore inside the building, or visit the tower of the church, but we opted to have a hot drink break in front of the church instead. We decided to walk along the Chain bridge back into Pest, where we had lunch at a restaurant next to the Christmas market. Whilst walking back to the city centre, we found the Four Seasons hotel. 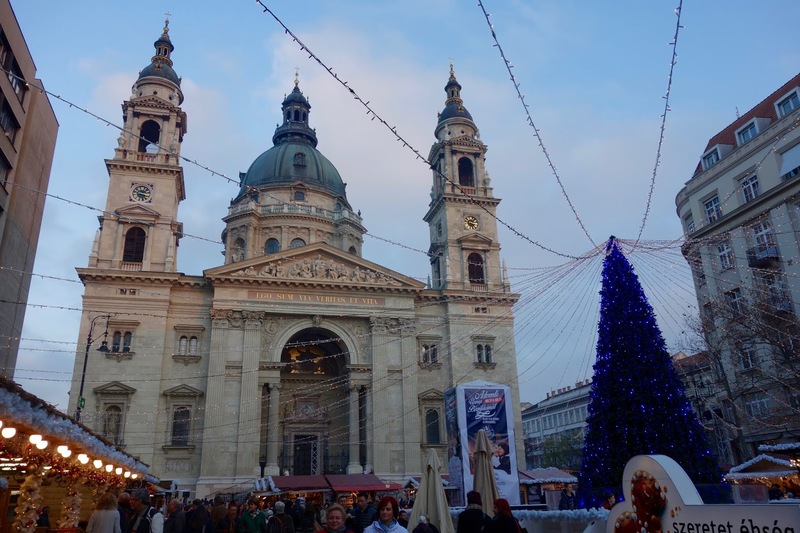 The one in Budapest actually had a Christmas market inside - how insane is that?! After booking flights to Budapest the week before, my friend and I reserved a table at the New York Cafe for tea on Saturday afternoon. We had incredibly high expectations as the cafe looked beautiful on google images, so we went back to the hotel to change into more formal attire. The cafe definitely lived up to my expectations - it was indeed very fancy inside! The service, however, was not so great. We ordered tea and a cake each and we waited a long time between ordering and paying for the bill. A group of women next to us actually refused to pay for their meal because they had waited 45 minutes for it to arrive! As the cafe was quite expensive, I probably wouldn't recommend it for more than a tea and cake unless you're willing to wait quite a long time for an expensive meal. I certainly wouldn't! 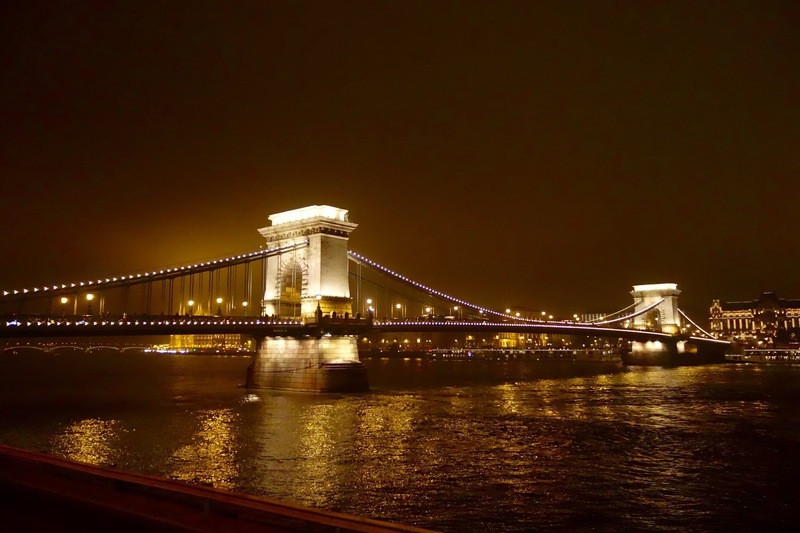 Afterwards, we decided to walk along the river, cross the Chain bridge and walk along the Buda riverside to view the main attractions again at night. 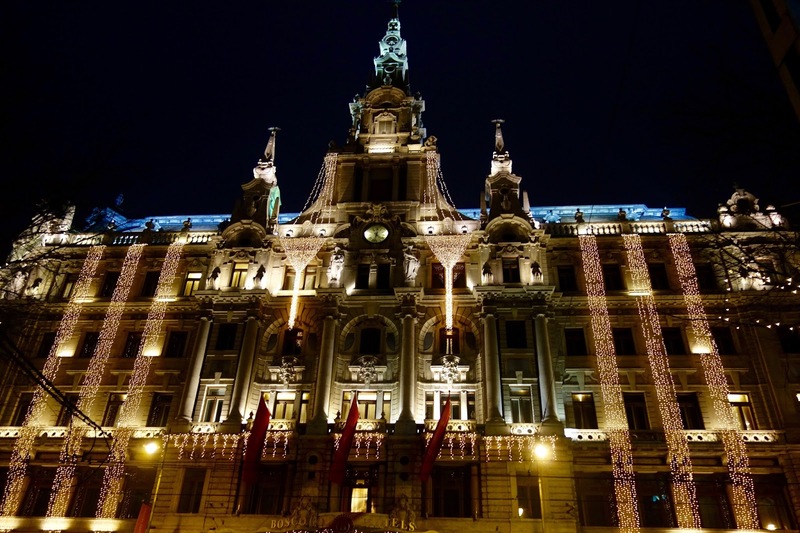 Budapest is beautiful during the day and looks even more spectacular lit up during the evening! We managed to take some photos of the Palace entrance lit up by multicoloured lights and of the boats on the riverside. 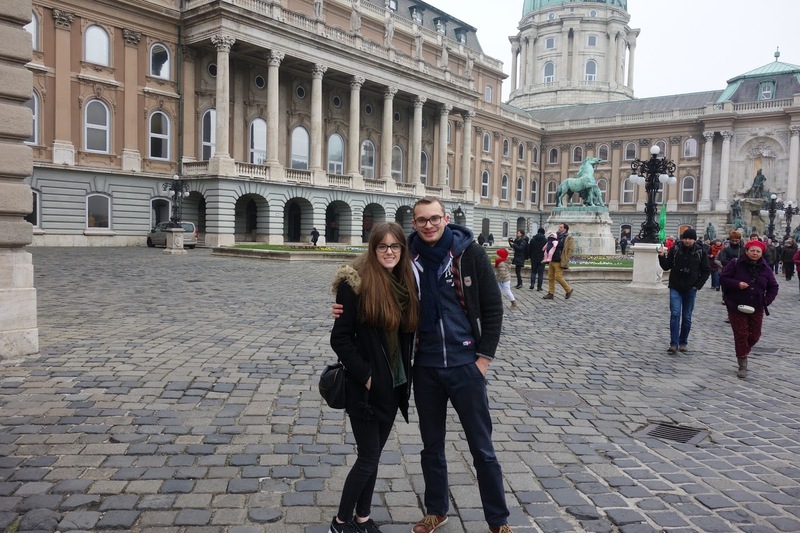 Winter has well and truly arrived in Belgium, but it was absolutely freezing in Budapest! My hands were numb after taking photos, so we opted to have a few drinks in a bar close to the hotel. On Friday, we tried to find the 360 bar, but it was closed for the Winter so we decided to look for the sky bar on Saturday evening. My poor navigation skills directed us along a few very quiet and dark streets, to the point where we started to feel quite uncomfortable and decided to scrap the idea and go into a bar on the main street where our hotel was located. Generally, I choose not to drink alcohol for a number of reasons, but I'm open to 'trying' anything new. Especially as I was in a foreign country and exposed to famous Hungarian Goulash, I thought it would be rude not to try some Hungarian shots. A taste of a Pálinka shot quickly turned into downing Tequila and Amaretto shots and it's fair to say I felt absolutely terrible and was afraid to even stand up after possibly over a year of not touching alcohol, albeit disappointed in myself for giving in to drinking it in the first place! Thankfully, the feeling wore off after 2/3 hours, and we ended up in McDonald's during the early hours of Sunday morning. I had booked a tour of the Hungarian Parliament before departing for Budapest, so we were up early in order to make our tour slot at 10am. The Parliament is full of symbolism - the number of stairs even represented the year the Parliament was created! 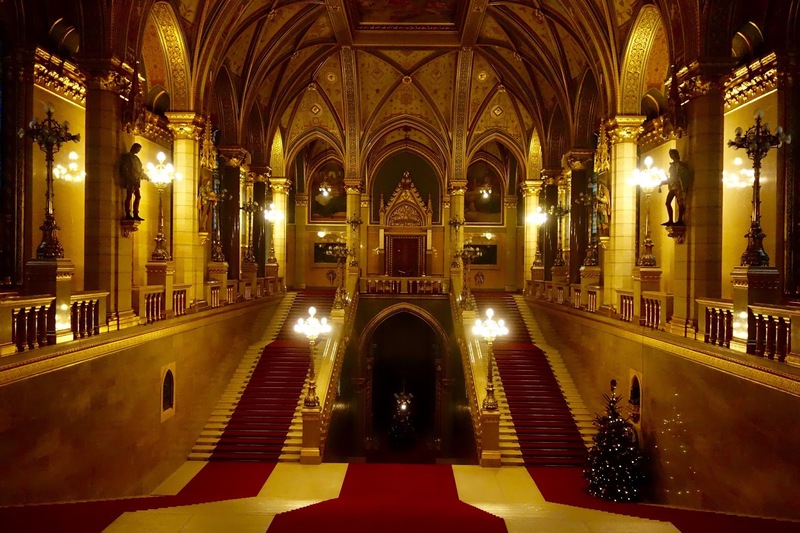 The Hungarian Crown Jewels are displayed in the Parliament, something I thought was quite strange, but interesting to see. Unfortunately, we weren't allowed to take photos in the room where the crown jewels were situated, but there was a huge chandelier (weighing 5 tonnes!) at the very top of the dome, above the crown, where the maintenance team actually had to enter through the roof in order to change the light bulbs! 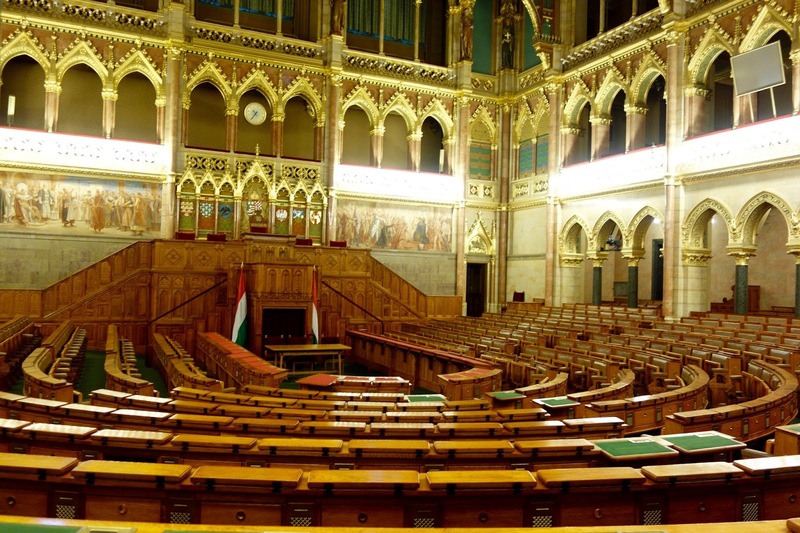 We were then directed into the Assembly Hall of the Parliament, where the MP's gather on a weekly basis. I was surprised to hear the number of MP's reduced from 386 in 1990 to the current number, 199. As a whole, I thought the Parliament tour was fairly interesting. Besides the Assembly Hall and the stairway, I don't think the interior was all that spectacular but for only 1000Ft (about 3 Euros), I couldn't really complain! After the tour, we decided to have an early lunch then head to the airport. We had booked an airport transfer bus back to Budapest airport, but opted to take public transport. 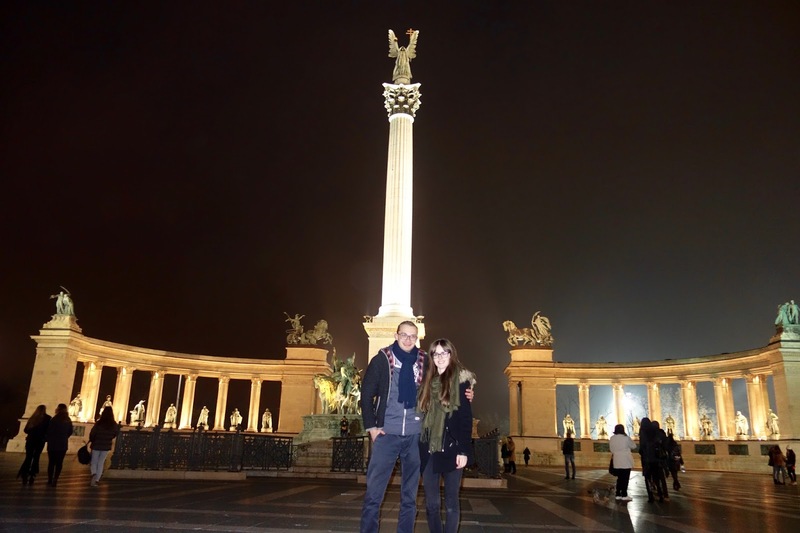 We relied heavily on the public transport in Budapest throughout the duration of our stay and it was brilliant! At first, it was quite difficult to figure out which stop to get off at - the Hungarian language is almost impossible to work out, definitely not comparable to just about getting the gist of a 'paleis' and 'kasteel' in Dutch! 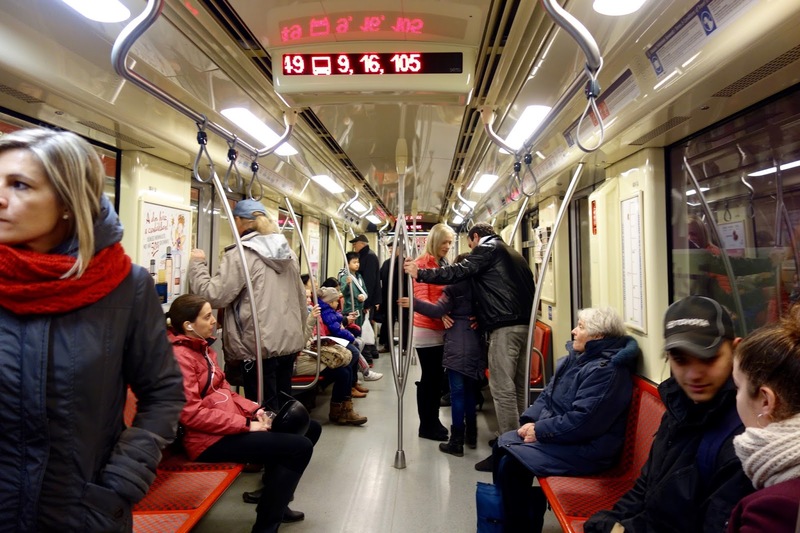 Some Metro lines were definitely nicer than others. 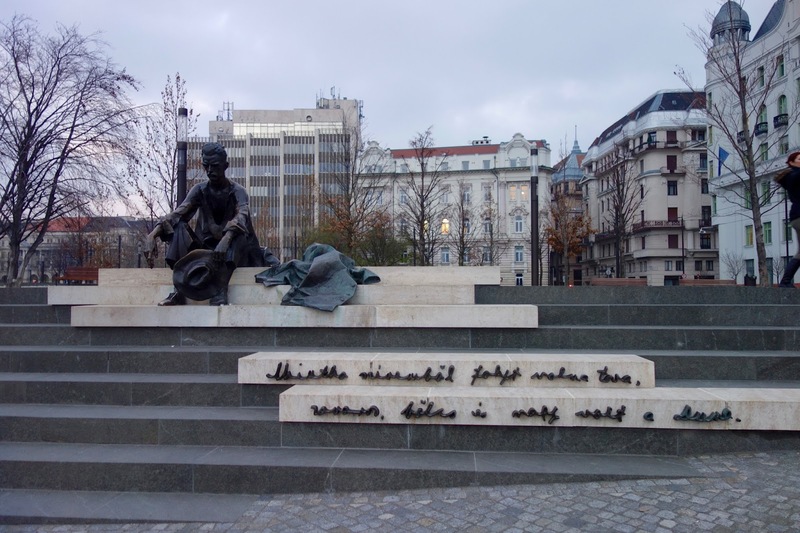 The nearest Metro to our hotel was 'Blaha Lujza tér' and the culture difference shocked my friend - there were a LOT of homeless people camping out in the metro station late at night. 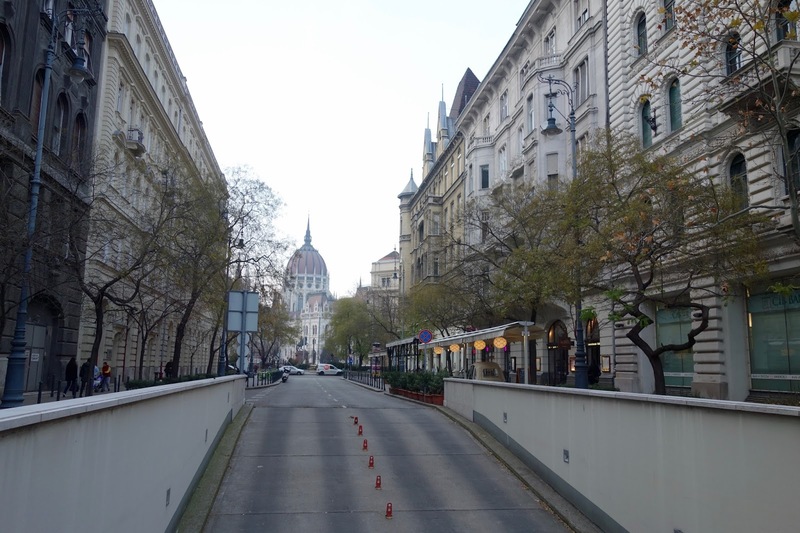 I wasn't at all sure what to expect in Budapest (Germany is the furthest I've travelled East in Europe), but I actually felt very safe walking around in Budapest, besides the underground. More so than Paris, where I have felt quite intimidated by some people. The Hungarians seemed to keep themselves to themselves and were very helpful and polite when we asked for directions at various times during the day. We took a train and bus to Budapest airport where we were greeted with a long queue for security. We arrived with plenty of spare time before our flight, but by the time we had finished at security, we had to board the plane immediately. Another bus and train ride followed the 2 hour plane journey and it's fair to say I was absolutely exhausted by the time I arrived back at my accommodation in Leuven. My trip to Budapest was incredible and I would highly recommend it if you're looking for an affordable city break. A 3 day visit allowed us to see all the main sights, but if you're interested in visiting all the museums, then 5 days is probably better! 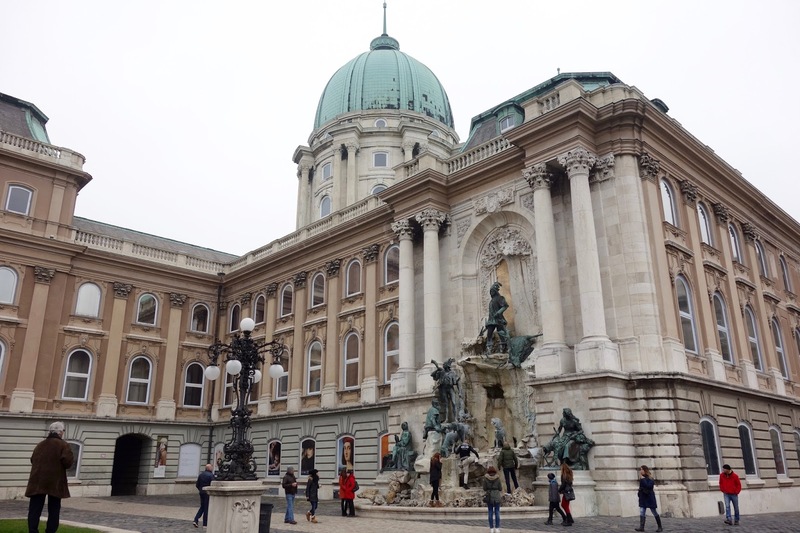 There are outdoor thermal baths in Budapest I was desperate to try out, but unfortunately time restrictions meant we couldn't do any extra attractions, so we had to prioritise. 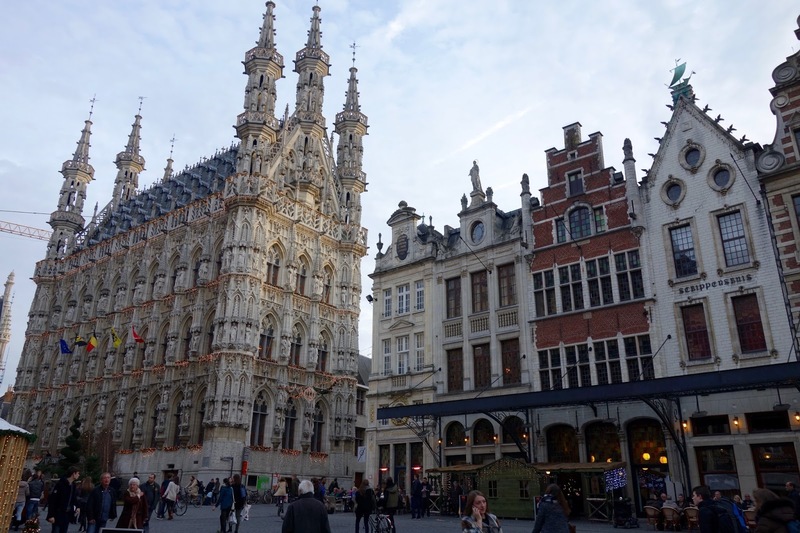 I'm definitely having some holiday blues whilst typing this blog post, but the best thing about living in Leuven is that I'm literally at the heart of Europe and all the countries I've always wanted to visit are very easily accessible and I'm excited to discover what else Europe has to offer across the next 7 months of my Erasmus year! As exams are slowly creeping up on me, I've had to devote any free time to studying, so it's a bit of a shorter and uneventful post this week unfortunately! I spent the beginning of the week catching up with my assigned readings for constitutional law- the textbook is very dry and boring to read, but it had to be done. 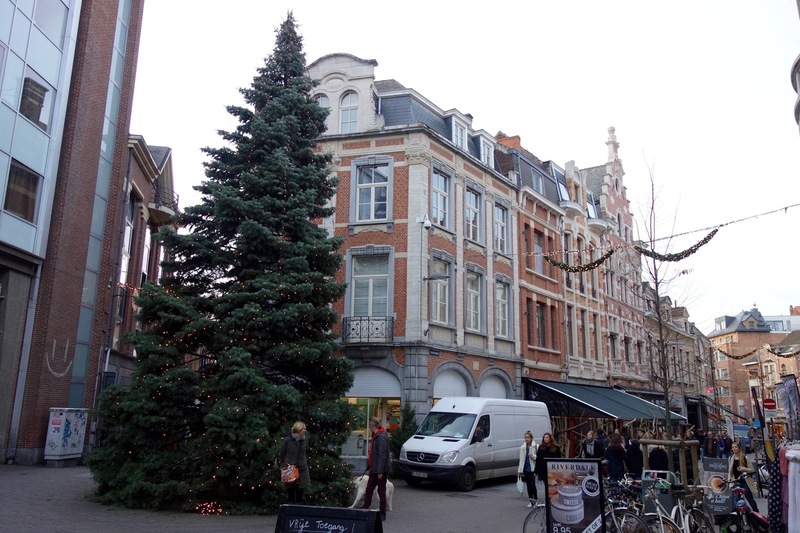 I took a break from studying on Monday afternoon and shopped around Leuven for a winter jacket. 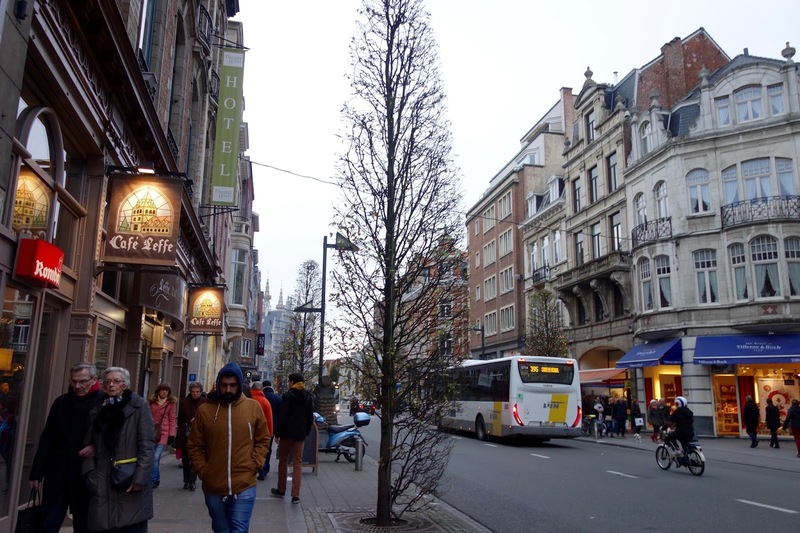 I have two jackets here in Leuven, but was really after an everyday black jacket. Unfortunately, I had no joy and went to my friend's residence to watch a couple of movies in the evening. I attended my 9am Criminal Law lecture as usual on Wednesday and met my friend who showed me around the main University library. 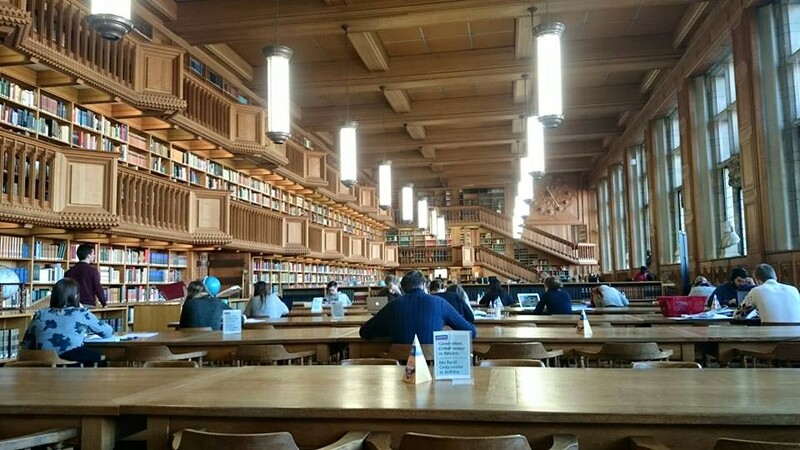 I visited the main KU Leuven library in the Summer, but as I had missed the library tour during the orientation week, I've been a bit nervous to go there on my own. The library itself is absolutely stunning, it's almost more of a distraction studying there than in my room! My culture card allows me to go up the University tower for a discounted price, so I'm hoping to take advantage of that soon as I think I'll be able to see a pretty good view of the whole of Leuven from there. After studying all morning, I had lunch with my friend at his residence's restaurant (Pauscollege). I believe the restaurant is affiliated with the other KU Leuven student restaurants, but I really don't like eating there. The dining hall itself isn't so nice and I had a dodgy looking pizza that day, so I won't be visiting again in a hurry! We had a quick hot chocolate stop and I attended my Terrorism and Corporate Crime class. I then headed to the Law library to finish my reading for the day. I still can't decide which library I prefer studying in. I haven't quite got the hang of how the law library works yet and it seems to be filled with Belgian students, so I'm verging on studying in the main library more often at the moment. My Thursday afternoon human rights lecture had been cancelled, so I walked into the centre of Leuven to buy my wristband for the Lokomotion party that evening. The wristband allowed for entry into 8 clubs for only 5 euros. After I had dinner with a friend, I met up with my law student friends and we all headed to the Musicafe. It was completely dead when we entered, so we made our way to ALMA 2 and surprisingly stayed there for the rest of the evening. I thought partying in a canteen was a bit of a strange concept, but it was actually one of the best parties I've been to in Leuven! Friday was chilled and only consisted of my human rights lecture in the afternoon. On Saturday, I was supposed to meet my friend from Edinburgh, but plans were changed last minute so I headed into the centre anyway to have a look around the shops again. 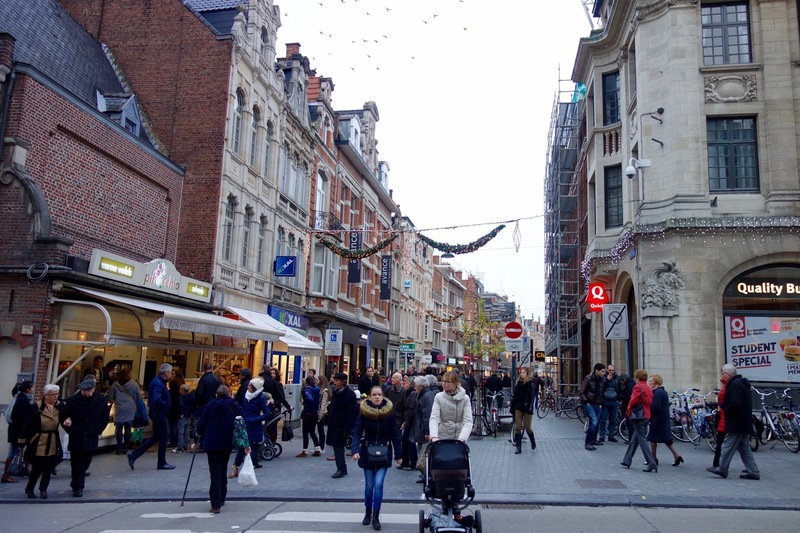 Leuven is OK for shopping, but a lot of the shops are for older people or aren't really student budget friendly. I love having a look in H&M and Zara, but that's about as far as my shopping venture goes in Leuven. 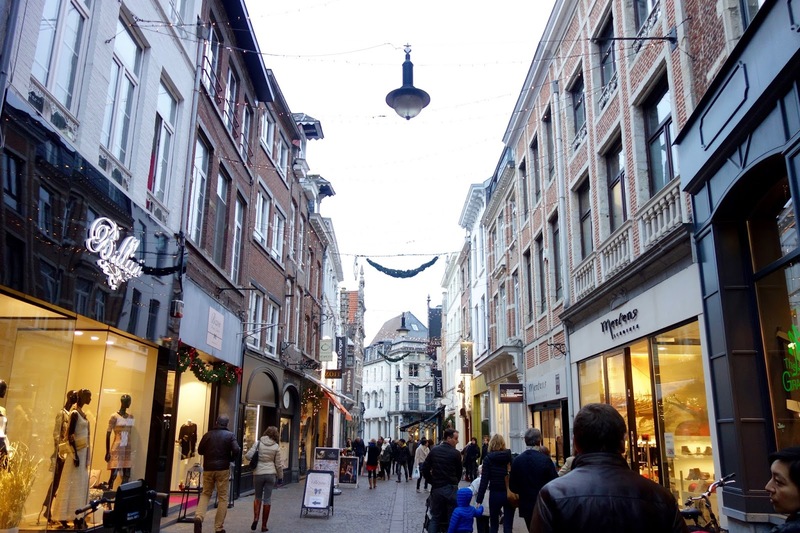 I love shopping in New Look and Forever 21 back in Scotland, so a trip to one of the bigger shopping cities in Belgium may soon be on the cards. On Sunday, I caught up with all of my online lectures from Edinburgh University. I have to take a course called 'Advanced Legal Methods' this semester and, admittedly, I had been slacking on watching the lectures every week. It's definitely not the same as physically being in the lecture theatre and since I've been finding the course quite cumbersome, I've been neglecting watching the content. I spent a total of 8 hours watching the lectures and I'm finally all prepared(?) for the final assignment due on the 14th of December. That's all for this week! 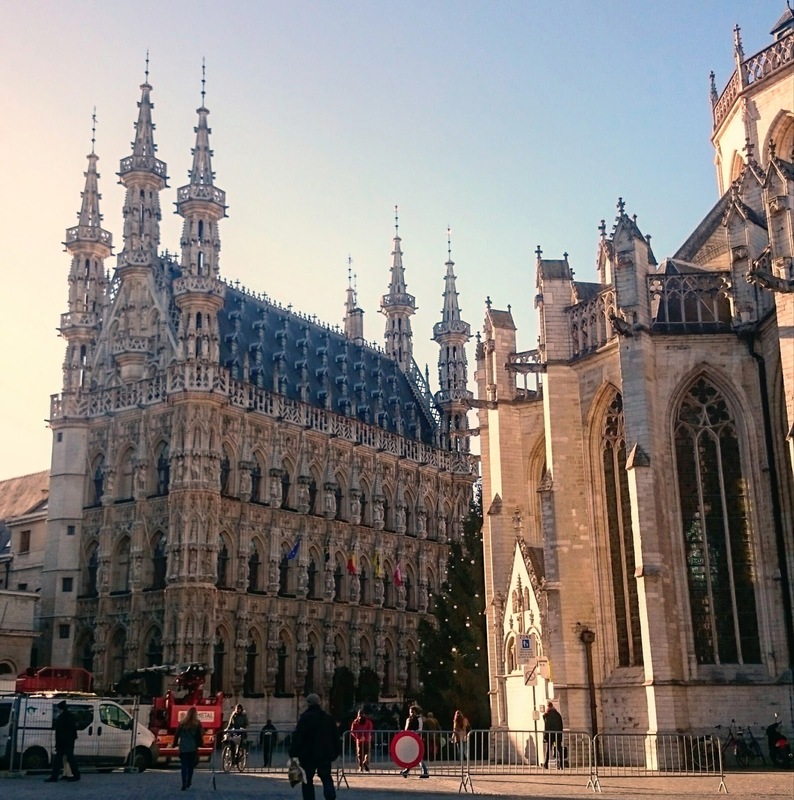 I only have three full weeks left in Leuven before I fly back to Edinburgh for Christmas - how crazy is that?! This week, my friend and I spontaneously decided to book a weekend away in Budapest next weekend before the mad exam rush starts soon. So, next week's post will be an interesting one for sure!